Some stories are made up with an intent. They are narrated with a passion and a desire which has to be felt be the readers in equal fervor. Author Rajbir Gill in his book "In Pursuit of the Woman" let readers follow a trail of words which is going to leave them mesmerized for a long time. So will this magic work? Let's find out. Facebook, smart phones, WhatsApp, Skype from business to love stories, these words have given a new definition to everything. Love birds have benefited the most with the surge of new technology! I Love You the three magical words can be conveyed to someone in a fraction of second. But imagine the time when communication was not this easy! Social Networking and apps were alien to us and mobile phones were just introduced; not to forget, they were too expensive for a common man to afford! But the dashing navel pilot Dev and gorgeous Suman should be thankful for being in love in the year 2000 when not everyone used a mobile phones and getting in touch with someone who does not have access to landline phone 24*7 was not so easy because if it was so, their love story would have never taken place. 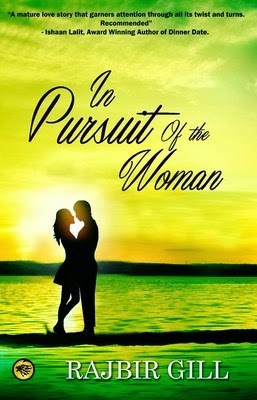 In Pursuit of the Woman is a love story that starts with confusion, proceeds with emotional trauma, passes through family drama and spices-up with heart attacks, reincarnation and their urge to stay together in spite of everything. If you are bored with the sappy college love stories every second book has and wish to read something different, yet so romantic, this book is for you! First look at the title and the cover and a lot of will be said about love. A beautiful cover image with a glittering background and a title with some mystery to it leaves readers in a lurch. The blurb talks about a man and a woman and their love for each other. It's a blurb which has been written with care guarding against all the guesses that one makes as what to expect from the story line. The story is of Navy Lieutenant Devinder Kapoor and a young college girl Suman. Suman comes to Goa on a college trip and their she fells in love with Dev immediately. The progress is slow and steady but it all happens so soon that none of them is able to get the wind of it. But destiny plays havoc when a brutal confusion creates chaos in the life of not one, not two but many people it leads to a lot of clashes, ego problems, the past and the present colliding. So what is going to happen to Dev & Suman's love story? Is there a twist in the tale? Where will all this utter confusion lead to? That's what the story is all about. Spinning a romantic tale with a spiced up surprise for the reader is a rare art. This story is just the exact bit of spice you need in your reading flavor. It's not outrageous but it's furious. It's misleading but in a fun way. It's full of excitement which never dulls down. It's a cocktail which will spin a lot of heads and it's a perfect recipe which will cook and taste balanced when it ends. The narration is candid and the events of the story glitzy. Nothing is less than a grand affair and the revelations are just top notch and handled well. The downside of the book is it's one character in the book which is constantly part of the story but not been given any front line monologue with Dev. That would have made everything perfect. All in all this book is just one step ahead of the expectations. It makes you run after it and then leaves you gasping for air for quite sometime. There's no stopping reading this one. It's the intensity and depth and the simplicity which will captivate the readers attention. It's the book for the masses and especially for the lovers.